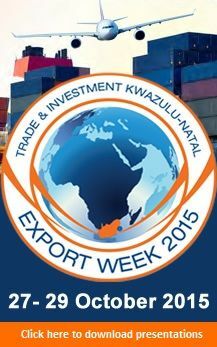 Successfully hosted by Trade & Investment KwaZulu-Natal, the 2015 installment of the Export Week took place on 27-29 October 2015, at Sun Coast Casino Conference Centre. The KwaZulu-Natal (KZN) Export week is an annual programme of Trade & Investment KwaZulu-Natal (TIKZN) that was developed to recognise, promote and assist with growing export businesses and industries in the province. Through the comprehensive programme of activities, it provides professional development and information on growth sectors and market opportunities to KZNÂ´s new and existing exporters and internationally focused businesses. The essence of this week was to establish an understanding and awareness of exporting and how KZN in particular can bridge the trade deficit gap between imports and exports. The motive behind the export week was to encourage more companiesÂ´ especially small companies to export more and diminish the trade deficit. Exporting creates many opportunities for the companies and the economy, it offers the advantages of a larger market with greater economies of scale, it provides an opportunity to grow and sustain business operations and it enables the province to attract investments and new business, thereby creating employment opportunities. The KZN Export Week commenced with a Masterclass, which targeted experienced KZN export companies who were keen on sharpening their capabilities in exporting. The session comprised of high level discussions, around EXIM Bank: a concept too significant for South Africa to ignore. The Export-Import Bank or EXIM Bank generally is a government agency that provides a variety of loan, guarantee and insurance products intended to aid the export of goods and services in the country where it operates. In most instances, the EXIM Bank is a state enterprise. South Africa does not have an EXIM Bank and purpose of the Master class was to debate the merits of such a financial institution to assist the business sector in foreign trade i.e. through imports and exports. The second element which was the Export Summit comprised of discussions and presentations around the Export Climate statistics (local, national and global), the blue economy as it relates to trade from a KZN perspective, aerotropolis- a KZN imperative, case studies by KZN companies and various breakaway sessions featuring the Visegrad Region (Poland, Hungry Slovakia and the Czech Republic), the Pacifica Alliance (Columbia, Mexico, Peru and Chile) and the India Ocean Island Region (Seychelles, Madagascar, Mauritius and Reunion). The 2015 installment of export week highlighted the significance of exporting to the economy of KZN and was aimed to celebrate the success of KwaZulu-Natal exporters. It was filled with information and networking sessions, an export business summit and was capped off with the Durban ChamberÂ´s Exporter of the Year Awards Gala Dinner.